Not exactly a great week on the markets, eh? Obviously I don’t like it when the baby gets thrown out with the bath water, which is exactly what transpired this week. The markets tanked, and to meet their margin calls the traders dumped their gold and silver futures, and their precious metals stocks. As a result, my stocks got hit. It’s a bizarre situation when the U.S. dollar is a safe haven, even though we know the currency is dead. Of course it’s only a safe haven because the Eurozone countries, like Greece, are in even worse shape. For a few days, or a week, or a month, everyone piles in to the U.S. dollar and out of gold and silver. And then reality sets in, and gold resumes it’s ten year advance, and the U.S. dollar resumes it’s multi year slide. 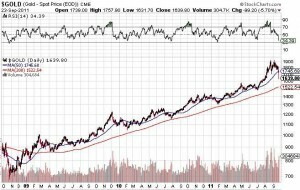 The “crash” this week in gold brings gold no where near it’s 200 day moving average. Gold dropped almost $100 on Friday, but it will take another $100 drop to take out the 200 DMA, and I doubt that will happen. Even if it does, that’s just an even better buying opportunity. The economy is collapsing, all fiat currencies are collapsing, and sane, rational investors are selling physical gold and silver and buying U.S. dollars? The “crash” is a paper crash, not a physical crash. Call up your local bullion dealer and ask if there was a wave of selling this week. Ask if people were lined up outside their door to convert their gold coins into paper dollars. Notice how the sell offs tend to start when the Comex opens in New York? The crashes don’t start in overnight trading in Europe. This is a paper driven crash, as the bullion banks take this one last opportunity to drive the paper price down so they can cover their short positions. A drop of $100 in one day is a fantastic way to cover your shorts, and save literally billions of dollars in the process. Eventually, however, the underlying price of the physical metal will reflect market realities, and if no-one is selling physical metal, the paper price is bound to rise. In the interim, don’t look a gift horse in the mouth. Take advantage of weeks like this and pick up stocks and precious metals “on sale”. Weeks like this are just blips on the radar screen, not a new trend. There may be more down days to come, but it’s in anticipation of weeks like this that I’ve maintained a cash position. And, at the end of the day on Friday, I deployed some of that cash. I sold my RSW – Rydex Inverse 2X S&P ETF, at a profit, which was my hedge against weeks like this. I then took some cash and purchased more shares of precious metal stocks like K.TO – Kinross Gold Corp. and FNV.TO – Franco-Nevada Corp. I also purchased the Franco-Nevada warrants that mature in March. They were down 30% on Friday, because they are highly levered. Perfect. A big up day means a 30% gain, and that’s the kind of day I like. But what if the crash continues on Monday? Gold isn’t going down to $200 per ounce. I doubt we will see $1,500, so if we are closing in on the bottom, now is the time to get positioned for the next upswing. Buy when there is blood in the streets, like this week. Thanks for reading, feel free to provide your comments below, and see you next week.